Feature-rich, yet intuitive, the 2020 FusionFX design software is based on Microsoft Office™ standards, allowing you to quickly create professional plans, stunning presentations and accurate quotes. A direct link to the Trimble 3D Warehouse™ lets you choose from a large online database of free SketchUp™ models tofurther enhance your designs. Also import 3D models into 2020 Fusion FX in several other recognised file formats. Design with confidence. 2020 Fusion FX gives you fingertip access to many local and international manufacturers’ products and catalogues. Improve your productivity by immediately generating customer quotes and ordering products electronically with 2020 Fusion FX. Intelligent sales tools let you manage every aspect of your project, from confirming delivery dates to ensuring millimetre perfect installation. Design more easily with 2020 Fusion FX, assisted by a variety of wizards, automated planning and optimisation tools. The stylish user-interface makes it simple for kitchens and bathroom professionals to benefit from the most popular CAD software in the industry. Inspired by the popular Microsoft Office™ the new and stylish 20 20 Fusion FX interface makes it easy for users to access the software’s many features. All functions are intuitively organized, with related tools and features grouped together logically in order to accurately reflect the workflow of customer management, design creation and presentation. 2020 Fusion FX users are also able to personalize their on-screen planning space by placing their favourite functions in the quick access toolbar and configuring their design tools to suit the way they work. Create and save predefined view layouts that can be recalled quickly and easily at each stage of the design process. Layouts can comprise any combination of views – plan, elevations, perspective, item list, report – and can be configured to be shown on one or more screens – ideal for designing and presenting alike. The 2020 Fusion FX help system now offers task and context based guidance to designers. Just type in what you want to do and the software will instantly find the function for you. As a registered member of the Microsoft Partner Network, 2020 continuously seeks to develop innovative customer solutions and services based upon Microsoft technologies. As such, their products are routinely submitted for all relevant testing and certification processes, the most recent of which has resulted in the award of the ‘Compatible with Windows 8’ logo for 2020 Fusion FX. This exciting new version offers designers enhanced flexibility and ease-of-use in creating visually stunning graphical renderings. With major enhancements to lighting, rendering, navigation and so much more, see your spaces like never before! 2020 Fusion kitchen and bathroom design software is renowned for its superior graphics and unrivalled presentation quality; but behind the imagery, a high level of detail gives users of Fusion design software the ability to create realistic plan and elevation diagrams. Save time with automatically generated reports. Produce detailed quotations, invoices, inventories, fitting reports and sales orders instantly. Dimension and annotate plans and elevations automatically. Plus you can automatically generate detailed order listings, per manufacturer. In 2020 Fusion you can choose from a range of different render settings that can be applied to your design – from WireFrame and WhiteFill renders, to photorealistIc Global Illuminations. Click here to explore an interactive 360° panoramic view of a new design, using your default web browser. Easy to use built in navigation tools will allow you to view the design in all directions and to zoom in on any areas of special interest. You can even view your panorama on a tablet or smartphone! WHAT IS 2020 FUSION FX? 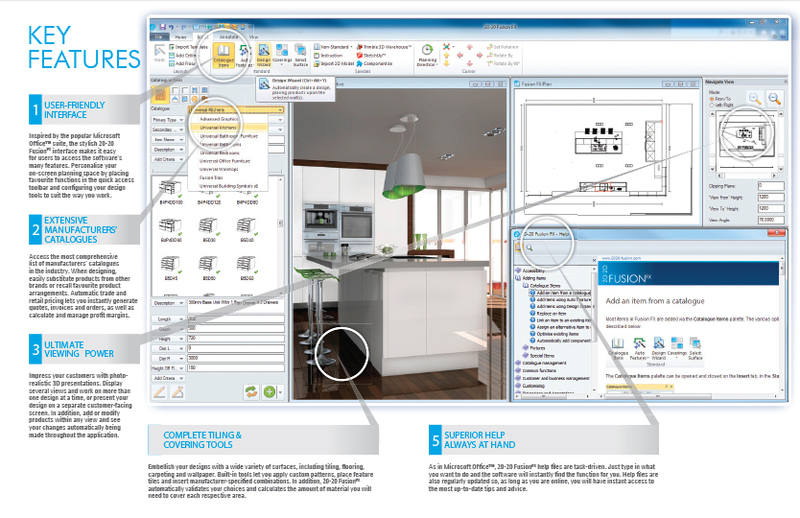 2020 Fusion FX is an easy-to-use kitchen and bathroom design software that seamlessly integrates cutting-edge technology and comprehensive sales management tools. This high-end professional sales tool builds on 25 years of industry experience, giving you the power to choose from thousands of manufacturers’ products. In addition, the software’s renowned graphical capabilities let you create impressive presentations and movies. WHO USES 2020 FUSION FX? 2020 Fusion FX is used around the world by kitchen & bathroom retailers, home builders, interior designers, home improvement centres, independent designers, architects and students. In fact, 2020 Fusion FX can be used by anyone wishing to bring their design ideas to life with an easy-to-use and intuitive computer-aided design solution. HOW CAN I PURCHASE 2020 FUSION FX? 2020 Fusion FX is free to all existing customers who are currently on our Software Maintenance Plan. Please refer to the ‘Is the upgrade from 2020 Fusion to 2020 Fusion FX free for existing customers?” FAQ for further guidance. New customers should contact our Sales Office for further details of the software and to arrange an appointment with your Local Sales Representative. IF I AM ON A BUDGET, DO I HAVE ANY PURCHASE OPTIONS? For further details regarding the available purchase options, please contact our Sales Team, or visit the Max vs Studio section of the website. DO I HAVE TO PAY ANY FURTHER FEES AFTER MY INITIAL PURCHASE OF 2020 FUSION FX? A monthly ‘Software Maintenance’ fee is charged to all customers for the first 12 months, which entitles them to scheduled new releases of the 2020 Fusion FX application software, updates to their chosen manufacturers’ catalogues and access to our dedicated Customer Support Team via telephone, Skype, and email. HOW LONG DOES THE PROGRAM TAKE TO INSTALL? The process for installing 2020 Fusion FX is extremely simple and will only take between 5 and 10 minutes, dependent on the speed of your computer. WHAT ARE THE 2020 FUSION FX TRAINING REQUIREMENTS? 2020 Fusion FX is intuitive, easy to use and designed to be used without the need to read complex instructions or user guides. Its user interface will be instantly familiar to anyone who’s ever used Microsoft Office™, giving the software an instantly accessible feel and making it easy for users to take full advantage of its many valuable features. Our beginner, intermediate and advanced courses offer customers the chance to achieve design excellence through guidance and training. With courses tailored to individual skill levels, trainees can learn everything from basic design principles to advanced technical expertise. To further explore your 2020 Fusion FX educational requirements and to find out more about training events, please contact our Customer Support Team. HOW CAN I GET ASSISTANCE WHEN USING 2020 FUSION FX? Detailed help files have been developed in line with Microsoft standards and are fully integrated within 2020 Fusion FX. The software includes a live link to a comprehensive online help system, providing users with structured support in performing a wide range of tasks within the application and ensuring that all guidance is fully up to date. Many areas of 2020 Fusion FX now also include context sensitive help, offering users direct access to targeted assistance on key features and functionality. Still can’t find what you’re looking for? 2020 Fusion FX customers also have access to our dedicated Customer Support Team via telephone, skype (8am-5pm, Monday-Friday) and email. IS THE UPGRADE FROM 20-20 FUSION TO 2020 FUSION FX FREE FOR EXISTING CUSTOMERS? Yes, the upgrade to 2020 Fusion FX is free of charge to all customers on the Software Maintance Program. If you are not on the Software Maintenance Program, or are not sure of your current status, please contact our Customer Support Team for further details of how to restore support. WHAT ARE THE 2020 FUSION FX TRAINING REQUIREMENTS FOR EXISTING CUSTOMERS? The transition for existing customers will be a relatively simple process and will require minimal training. All of the standard features and tools previously found in 2020 Fusion are still present in 2020 Fusion FX and continue to function in the same way. The primary difference between the two versions is the new user interface, which will be instantly familiar to anyone who has ever used Microsoft Office™products. To help customers become acquainted with the new user interface, the software has a brand new help system (see ‘How can I get help when using 2020 Fusion FX ?’) making it quick and easy to locate familiar features and functions. In addition, a series of tutorial videos will be available on the training section of our website. DO EXISTING CUSTOMERS NEED TO UNINSTALL THEIR PREVIOUS VERSION OF 20-20 FUSION, BEFORE UPGRADING TO 2020 FUSION FX? No. It is not necessary for previous versions of 2020 Fusion to be manually uninstalled; this process will be completed automatically during the installation of 2020 Fusion FX. WILL MY 2020 FUSION CUSTOMER DATABASE STILL BE AVAILABLE AFTER UPGRADING TO 2020 FUSION FX? Yes – all of your customers and their associated designs will be retained following the upgrade process. CAN 20-20 FUSION FX OPEN DESIGNS ORIGINALLY CREATED USING PREVIOUS VERSIONS OF 2020 FUSION? Yes – designs created using previous versions of 2020 Fusion remain fully compatible with 2020 Fusion FX.